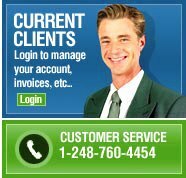 Welcome to the My Account section, we have created this web-based applications to allow you to go in and be able to retrieve all the invoices that have been issued to you, any invoices that are still active that need to be paid for, a detailed description of every task that was performed in each invoice. This service is available to you at no additional task 24/7. Please provide your login information below to continue. If you have already received an invoice from us, you by default have an account created with us, please provide the information below to continue the rest of the activation process and login.